Click image to visit a photo album from the day. A parade of physician assistant students filed into the University Conference Center at Penn State Health Milton S. Hershey Medical Center Friday afternoon with sacks of soy flour and rice slung over their shoulders. Others lugged plastic tubs filled with a dried vegetable mix, vitamin packets, funnels and digital scales. In a matter of minutes, they set up stations for scooping and sorting, weighing and sealing more than 14,000 nutritionally complete meals to be distributed in some of the world’s neediest regions. It is a tradition the students began last year as a community service project and looked forward to repeating. 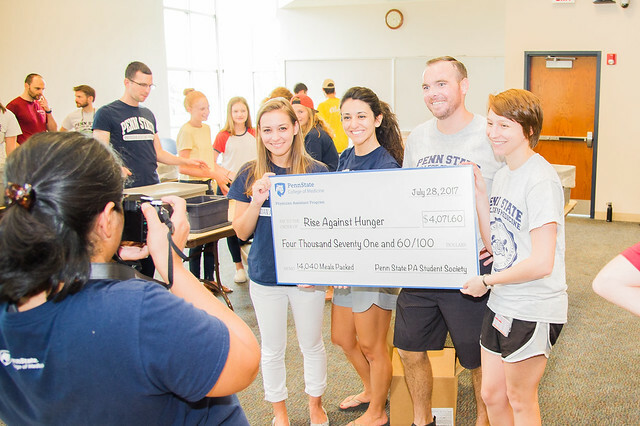 Bernie Shaw, 2018 Physician Assistant Program class president, said the 60 students held bake sales and raffles and participated in the Highmark Walk for Humanity 5K during the academic year to raise more than $4,000 to purchase the meals from Rise Against Hunger. The organization’s goal is to end world hunger by 2030. Caryn Stopper, director of admissions for the Physician Assistant Program at Penn State College of Medicine, said she was impressed that the students were able to raise more than the minimum of $3,000 for the project. “That’s a really lofty goal as full-time graduate students,” she said. As the students – together with family members, friends and program staff – pulled on red hairnets and plastic gloves, David Cook with Rise Against Hunger shared sobering statistics with them and encouraged them to stay involved in the mission. “We’re not talking about ‘I didn’t get lunch yet, so I’m pretty hungry’ kind of hunger here, but chronic hunger,” he said. The meals are distributed through schools in developing nations so families are rewarded for allowing their children to receive an education that can help end the cycle of poverty. Stopper said the event brings the two classes together, along with program alumni. Upbeat music blasted from speakers as the students worked and chatted. The Nittany Lion strolled in, strutted from table to table and danced with the volunteers. Each time 1,000 meals were boxed, Cook hit a gong and cheers erupted. Hayley Knostman, a second-year physician assistant student from Texas, said she enjoyed the afternoon working together with her peers. Entry filed under: News. Tags: pa program.